A year ago Chris and I decided to change the way we eat. I was resistant and pouty at first because I new it meant more work. I didn't see how we could possibly do it considering that we live in a very Wal-Mart dominant City. That first grocery shopping trip to the health food store took hours. We had to read every label, ponder every purchase, and gulp over the final bill. But we learned what to buy and where to buy it and now the weekly grocery shopping trip is an outing that we actually enjoy. But it doesn't end with the shopping. I enjoy planning our meals. Even when I come home from a long tiring day, I find joy in chopping and preparing the evening meal. 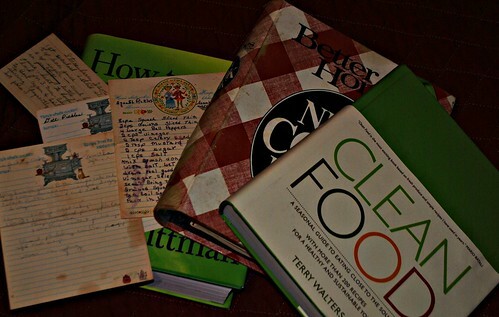 I've begun to rely on cookbooks and my collection of them is growing. The last time I was home I was even able to pry some of Mom's old recipe cards from her. I now have the only written copy of the famous Pea-picking Cake. I've promised Chris that recipe stays just between us, but I will tell you that there are no peas in the cake. In fact, no one has any idea why it's even called Pea-picking Cake. But we all agree that it is the best cake ever. My initial fears over the big food change was just silly. We all know how important food is, particularly the right food. Most of those great memories of childhood revolve around the family gathering around the dinner table or hanging out in the kitchen. And it's only right that it should be a huge part of our attempt to think out of the box and try new things.